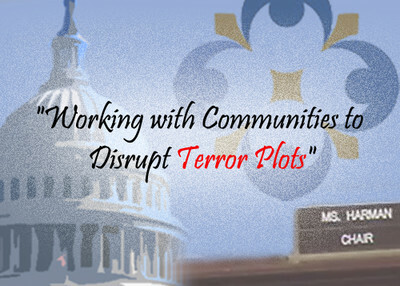 Rebutting criticisms that were not made, and often ignoring those that were, witnesses and representatives in a House subcommittee hearing on disrupting terror plots through community engagement often lost focus on their task Wednesday. The digressions began when Jane Harman, chairwoman of the Subcommittee on Intelligence, Information Sharing and Terrorism Risk Assessment, read an excerpt from an article published Tuesday by the Investigative Project on Terrorism. It raised concerns about the hearing's absence of Muslim voices who are detached from national political organizations which have a record of extremist rhetoric and hostility toward law enforcement. "One of the criticisms today says that 'the committee is seeking input from a narrow viewpoint – one that is sympathetic to Islamist extremist organizations here in America.' Well I'll state my own view, that is not my own view. I am not sympathetic to extremist organizations in America." "Extreme views are protected by our Constitution. We're not talking about extreme views. We're not talking about so-called radicals, either on the left or the right of the spectrum. We're talking about people who intend to engage in violent behavior. Behavior is not protected – violent behavior is not protected in our Constitution ... only the expression of extreme views is protected under our First Amendment." To be clear, the IPT story never advocated silencing anyone's speech. It recommended that other voices be included and included some suggestions. The testimony seemed to validate the concern that the hearing offered a limited perspective on how to court Muslim-American communities. Harman's response, meanwhile, ignores the link between extremist rhetoric and the radicalization process that may lead to violence. Radical clerics like Anwar Al-Awlaki are creating waves of terrorists through charismatic sermons and a message that America is at war with Islam and Muslims. One of the most important factors in radicalizing young Muslims is "the perception that Islam is under attack from the West." Many of the groups at the center of government outreach efforts perpetuate that message. In a way, witness Mohamed Elibiary did too during his testimony. Elibiary, President and CEO of The Freedom and Justice Foundation, criticized federal law enforcement for targeting "low-hanging fruit" and using "agent provocateurs" to infiltrate mosques. That line has been pushed by Islamist organizations for more than a year, despite a growing record of informants disrupting significant terror plots throughout the country. In his prepared statement, Elibiary made a point of defending one of those Islamist organizations, the Council on American-Islamic Relations (CAIR). The organization was "brave enough to step forward and allow us to facilitate the cooperation with the FBI concerning the recent disappearance of 5 young men to Pakistan from Alexandria, Virginia," he said. Whether reporting the disappearance of five would-be jihadis is brave or not, CAIR did do the right thing in that case. However, CAIR's broader record – condemning virtually all terror finance prosecutions, and refusing to condemn Hamas and Hizballah – offers ample cause for suspicion whether it represents a trustworthy partner for law enforcement and government agencies. The FBI's decision to cut off outreach communication with CAIR in 2008 is well documented, yet committee members and witnesses seemed ignorant about the reasons behind it. Exhibits in the Hamas-support trial of the Holy Land Foundation (HLF) and five former officials show that CAIR was born out of a Hamas-support network in the United States called the Palestine Committee. That network included HLF and entities created by Hamas political leader Mousa Abu Marzook. Harman repeatedly acknowledged that CAIR is "controversial," but never mentioned its creation or links to a terrorist group. To his credit, Elibiary acknowledged that any CAIR official who is found to be part of a crime should be charged, but asserted the organization should be left alone. CAIR has never owned up to its history, even though the evidence comes in the form of internal Palestine Committee records and in its founders' participation in a 1993 gathering of Hamas supporters. Having never acknowledged these truths, CAIR cannot even claim that it has changed its ways. In a recent letter, Assistant Attorney General Ronald Weich wrote that the HLF exhibits and testimony "demonstrated a relationship among CAIR, individual CAIR founders, and the Palestine Committee. Evidence was also introduced that demonstrated a relationship between the Palestine Committee and HAMAS, which was designated as a terrorist organization in 1995." All the witnesses agreed CAIR is not a terrorist organization. But that's not really the question. A grand jury in Washington, D.C. is investigating whether it is a terrorist-supporting organization. Baca: "And I'll be there 10 more times." "I served in the United States Marine Corps," Baca shot back. "I put my life on the line for people to do what you just did to me, but I'm not going to let you do that here. My record is clear. CAIR is not a terrorist supporting organization. That is my experience, that is my interaction, and if you want to promote that, you're on your own." Other panelists defended CAIR, too. Northeastern University School of Law Professor Deborah Ramirez described it as respected in the community and as "a large, well-respected, grassroots organization. And without CAIR at the table or by excluding or demonizing CAIR as a terrorist organization you exclude the grassroots members of the community who have the information that's necessary for thwarting counter terrorism." Elibiary claimed CAIR "was totally funded by the community." Again, there's evidence to the contrary. IRS records show that CAIR's membership rolls have plummeted in recent years. Yet, the organization vehemently contested a Washington Times report showing this. CAIR claims not to accept foreign money, yet State Department records show its officials sought hundreds of thousands of dollars during 2006 trips to Saudi Arabia and the United Arab Emirates. The hearing did include ideas for fostering community relations, many of which have merit. But the refusal to address the monopoly held by national Islamist organizations may prevent emerging new voices to gain traction and speak for a broader, more diverse Muslim-American community. Harman closed the hearing by again referencing criticism she expects to come her committee's way. It was a little odd for a veteran politician – she's in her ninth term – to be so defensive about a call for her to seek out more diversity in her witnesses. There was never a suggestion that the invited witnesses be removed from the panel. The concern that they offered a fairly uniform perspective, with a few exceptions, was validated in their testimonies. "We must be working together to identify and implement real solutions to counter radical, violent ideology and to prevent terrorism. I look forward to hearing from you about what your solutions are. And we must also ensure a diversity of thought at the table. For instance, who are we partnering and engaging with? Are we strengthening our relationships with those moderate Muslims who may already be doing their part? Or primarily, if not only, engaging with groups that have the loudest voices or perhaps even extremist ties?" As time goes on, and I read more news items, I am starting to realize that when unfounded allegations, heresay, rumor, innuendo, and conjecture portray an individual as "guilty by association", it is Representative Harman who reminds her colleagues that there is a Constitution, and individuals have rights. The implication that Sheriff Baca has ties to Hamas is scary. Not because Hamas are scary, they are, but because members of law enforcement are willing to make statements with no real proof! How many individuals are on watchlists as a result of "loose cannons" firing broadside attacks against innocent individuals. Throwing spaghetti against the wall to see what sticks is no way to run a law enforcement investigation, it does more harm than good. Thank you for being there for the Constitution Representative Harman, I wish there were more like you.